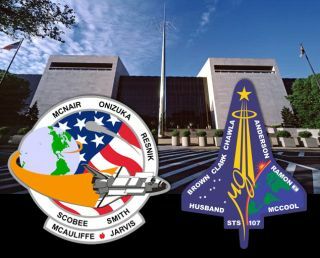 The National Air and Space Museum is considering the display of debris from space shuttles Challenger and Columbia. The Smithsonian Institution's National Air and Space Museum may incorporate debris from space shuttles Columbia and Challenger in its new gallery dedicated to the soon-ending shuttle program. The Washington, D.C., display will only go forward however, if the families of the shuttles' fallen astronauts and NASA agree with the museum's plans. The solemn artifacts, which were recovered in the wake of the loss of shuttle Challenger 25 years ago last week and the loss of Columbia 8 years ago on Feb. 1, would be used to teach the public about the conditions that led to the two tragedies, according to curator Valerie Neal who spoke exclusively with collectSPACE.com. "We now have an exhibit environment, the new 'Moving Beyond Earth' exhibit, where we will address each of the tragedies," Neal said. "So, having an artifact related to them would be appropriate. It would be part of a story and it wouldn't be just an object that people would stare at and say 'Wow, that's part of the tragedy.' But it would it be an object that they could learn something from." Workers lower STS-51L Challenger wreckage remains and boxes of debris into abandoned Minuteman Missile Silos at Complex 31 on Cape Canaveral Air Force Station. Challenger and its seven-person STS-51L crew were lost 73 seconds into the orbiter's 10th flight on Jan. 28, 1986. Cold weather had compromised an O-ring seal on one of the shuttle's two solid rocket boosters, resulting in hot gas burning through the right booster, damaging the hardware that connected it to the vehicle and causing the structural failure of the shuttle's external fuel tank. Columbia, with its seven STS-107 astronauts, broke apart during reentry into Earth's atmosphere on Feb. 1, 2003. Its loss was predicated by its left wing sustaining damage 16 days earlier during launch. A small piece of external tank insulating foam struck the wing's leading edge, leaving a hole that went undetected during the flight. According to Neal, who curates the space shuttle program for the National Air and Space Museum, whatever debris is chosen, it would need to tell a story. "Whatever we'd be interested in showing would have to have a story to it in its own right and not just be displayed as a piece of debris from the vehicle as simply a sign of the tragedy," Neal said. "It would need to have more content to it, otherwise it would be too much like just displaying a car that is involved in a terrible smash up so that people can see how awful it was. We wouldn't want to just do that. There's something kind of prurient about that." "So if there are articles that had a particular story to them, then I think those would be candidates for display," he added. Those debris stories would be displayed inside the Moving Beyond Earth gallery, an exhibition devoted to the shuttle and space station programs, now under development. The first phase of the gallery opened to the public in 2009. The debris would be placed aside other exhibits designed to explain the tragedies and lessons learned from them. "From the manufacturers we are going to try to get a piece of an O-ring, if not an entire O-ring and also a piece that has burn-through, so you can see, graphically, what burn through or near-burn through looks like," shared Neal. An overview of the Columbia debris reconstruction hangar in 2003 shows the orbiter outline on the floor with some of the 78,760 pieces identified to that date. More than 84,000 pieces of shuttle debris were recovered, some of which is included in a traveling NASA display to stress safety. "And for the Columbia discussion, we're obtaining a mock up of the [external tank] PAL ramp area and a sample of the foam, so you can see what the foam looked like and how big a piece of foam was it. And we'll probably also have, if not a whole leading edge panel, some portion of a wing leading edge panel." "That all fits together and gives [the debris] context. It gives a story so you can learn something, so it is not just a macabre object. People used to go to museums to look at shrunken heads or something like that. We don't want to just put a curiosity piece out there as that is kind of morbid, which people wouldn't learn anything from." "We want to create enough of a story that [visitors] can achieve a better understanding [of the tragedies]. If the object helped to accomplish that, then I think it would be appropriate to display the object," explained Neal. Continue reading at collectSPACE.com to learn why curator Valerie Neal feels now is the time to display the debris and how she intends to involve the fallen astronauts’ families in the decision.